Lialia Kuznetsova was born in 1946 in Uralsk, Kazakhstan. She studied at the Kazan State Aviation Institute and worked as an aviation engineer before she took up photography in the late 70’s. In 1978 she worked as a photographer in the Kazan State Museum of Art and the following year she was accepted at the Union of Lithuanian Art Photographers. From 1980 to 1982 Kuznetsova was a reporter for the newspaper Vechernyaya Kazan (“Evening Kazan”) and since then she has been a freelance photographer. Lialia Kuznetsova is now known throughout the world. Only one “against” vote prevented her from becoming the second Russian photographer at Magnum agency. She was a member of the legendary photography group TASMA alongside Vladimir Zotov, Edward Khakimov, Rifkhat Yakupov, Farit Gubaev and many other photographers. Lialia Kuznetsova’s work has been exhibited many times in Europe and America, in particular at the Corcoran Gallery in Washington. 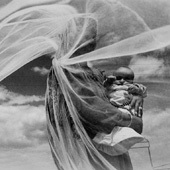 In 1997 Kuznetsova was awarded the Mother Jones Leica Medal of Excellence and the Gran Prix for a photograph in Paris. Several global publishers, including Aperture, have published many copies of Lialia Kuznetsova’s book and in July 2011 the first copy of her book Doroga (“The Road”) was published at the Leonid Gusev publishing house. The book included the best photographs taken by Kuznetsova throughout her entire creative career.